Westchester Community College Center for the Arts is centrally located at the Westchester County Center in White Plains. The Center offers a rich variety of credit and non-credit courses, serving matriculated students as well as the community’s needs for enrichment. The Center’s programs have evolved over the years into a full spectrum of offerings in the visual arts, computer arts, design, craft media, and liberal arts. The Center offers thirteen fully equipped laboratories for Black & White and Digital Photography, Digital Arts, Ceramics, Jewelry/Metalworking, Sculpture, Painting, and Drawing, as well as several Multimedia-equipped lecture rooms. Join our community! We offer a wide variety of Community Education courses for all ages that enrich lives and forge friendships. 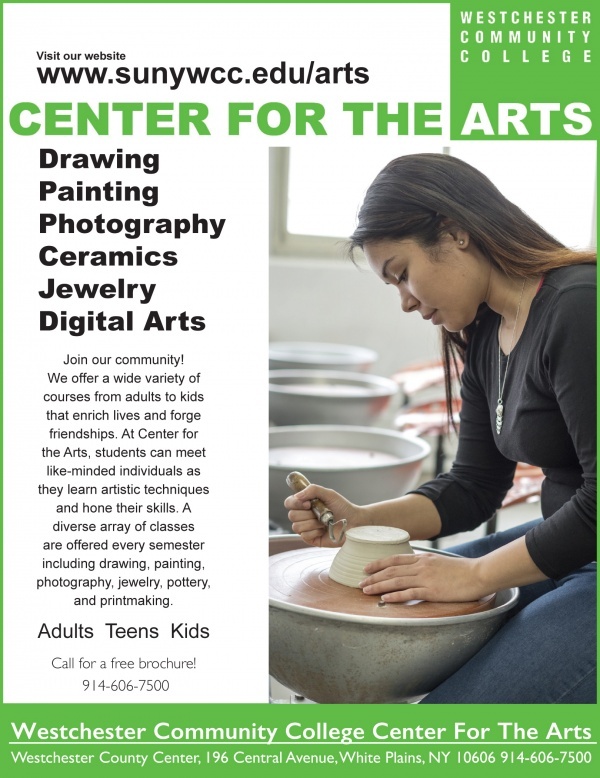 At Center for the Arts, students can meet like-minded individuals as they learn artistic techniques and hone their skills. A diverse array of Community Education classes are offered every semester including drawing, painting, photography, jewelry making, pottery, and printmaking. Please visit us anytime, we are located at the Westchester County Center, 198 Central Ave. in White Plains. Call for our free brochure at 914-606-7500.